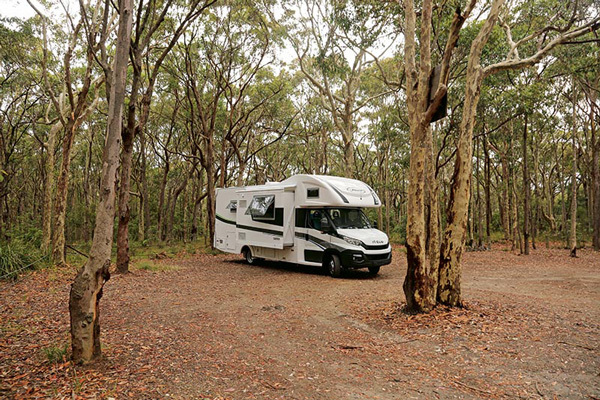 I picked up a new Sunliner Switch S541 motorhome from Newcastle-based Australian Motor Homes, which is a long-term Sunliner dealer. The S541 has an offside slide-out and is based on an Iveco Daily 50-170 Hi-Matic cab chassis. This is much improved over early Dailys, particularly the new eight-speed torque converter fully automatic gearbox. 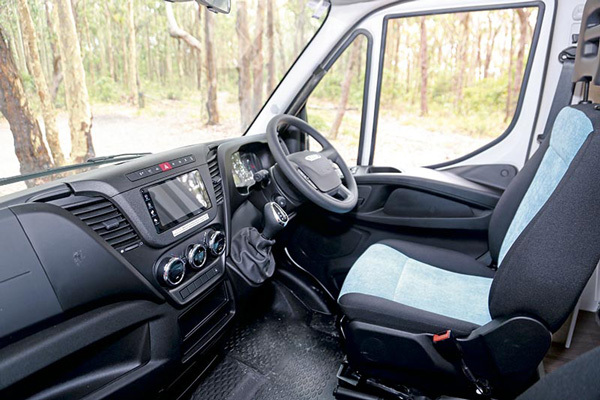 Buyers who tend towards the Mercedes-Benz Sprinter base vehicle because of its auto gearbox now have a cheaper alternative. Although the Daily shares the same parent company as the Ducato – Fiat – the two don’t have much in common apart from the 3L turbodiesel that powers them. 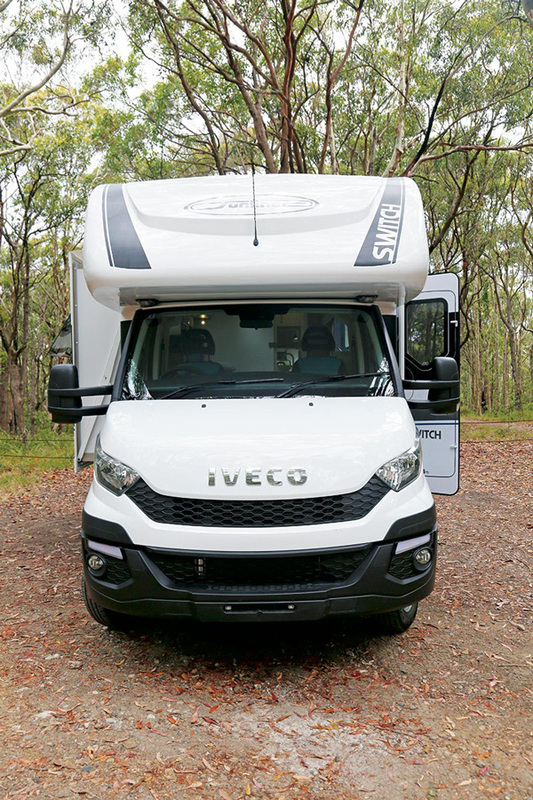 The Ducato tends to occupy the lighter end of light commercial vehicles, whereas the Daily is good for heavier loads and larger motorhomes, such as this Switch. On the road, it’s a relatively smooth performer, with the gearbox and turbodiesel engine working well together. The Daily comes with a respectable towing capacity of 3500kg and, like the Ducato, the Daily comes with a three-year, 200,000km warranty. There’s just one thing I’d like Iveco to fix: the handbrake. The handbrake’s location interferes with the swivelling driver’s seat and makes turning the seat around a bit of a wrestling match. I figure if Fiat can do it with the Ducato, why can’t it do the same with the Daily? With the entry door right behind the front cab, the S541 has a very open layout, especially with the slide-out extended. The kitchen bench sits along the mid-nearside and directly opposite that, the cafe-style dinette and fridge (with microwave above) sit within the slide-out. That leaves the rear for an east-west bed and a rear bathroom right at the back. 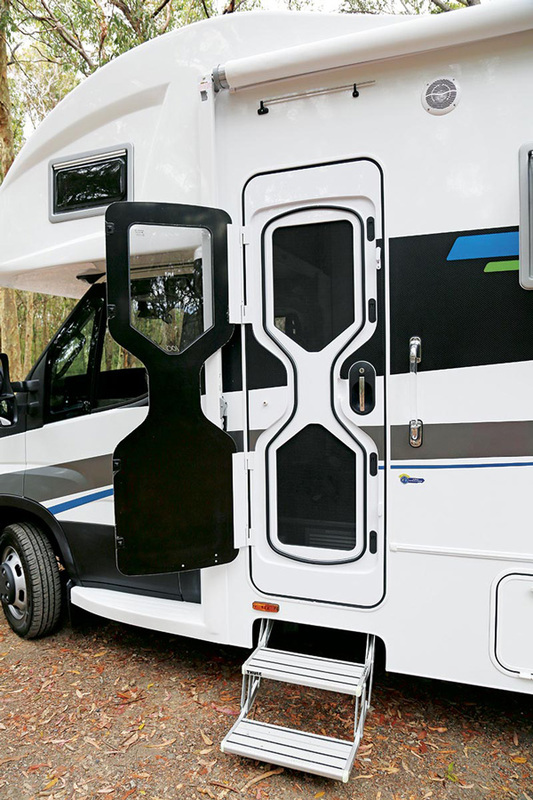 When the slide-out is extended, there is plenty of space in all areas of the van but, even with it closed up, there is still room to move between the front and the rear of the motorhome – which is not always the case with some designs. 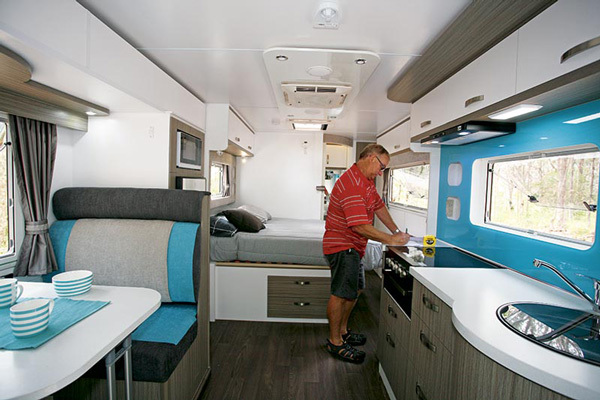 There are actually two beds in this Switch motorhome, one above the driver’s cab in the Luton peak and the main bed towards the rear. The Luton bed comes with a curtain for privacy and the whole bed can be lifted out of the way if it’s not needed or just to give easy cab access during the day. 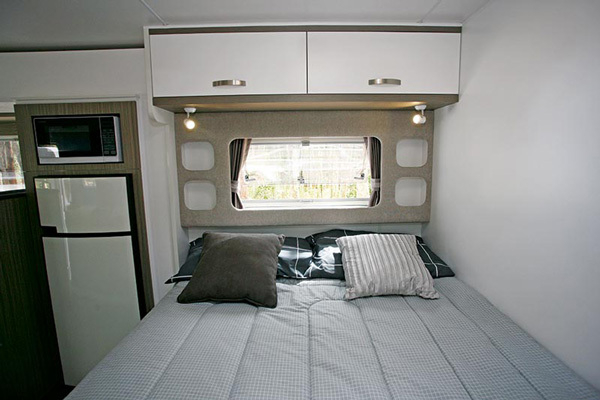 The rear bed doesn’t have a privacy curtain but measures 1.9x1.37m (6ft 3in x 4ft 6in) with a bolster extension. You can easily walk around the bed, even in its extended length, which is not always a given. The posture slat bed base can be lifted for access to the under-bed storage space, but there are also two large drawers at the front of the bed, so lifting the base may not be necessary every time. The corner stabiliser winding handle and the winder for manually closing up the slide-out (if required) are located under the bed. The wall behind the bed has a padded surround with little compartments, similar to the kitchen splashback. Given the lack of bedside cabinets, it’s a neat idea, especially as one has a combo 12V/5V USB charger socket. 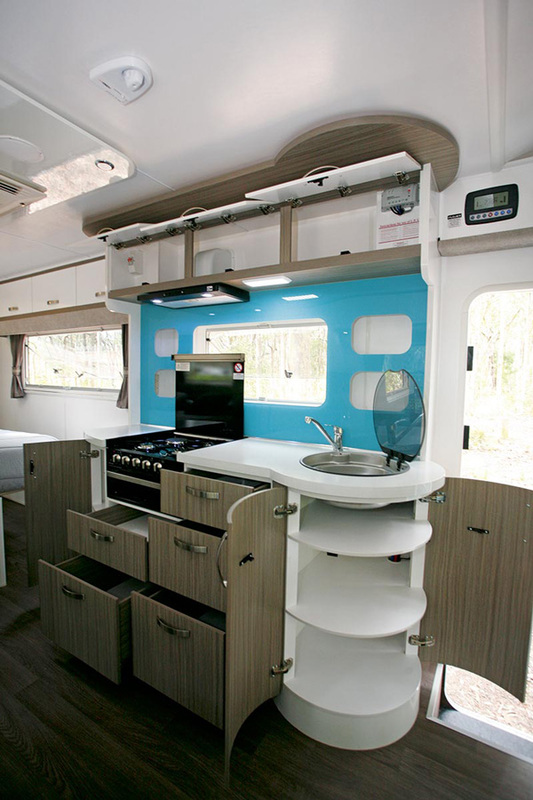 The kitchen bench is surprisingly large and much more practical than some of the minimalist kitchens we see in RVs these days. It’s also an interesting shape, with a circular cupboard and a round stainless steel sink at the front end. The splashback, which encompasses the whole kitchen wall, is also worth a mention; it sits off the wall and has four small compartments – two at each end – each large enough to hold something like an iPad. And with 240V, 12V and 5V charger sockets at the far end of the bench, it provides a convenient and tidy way to store your electronics while they’re charging. 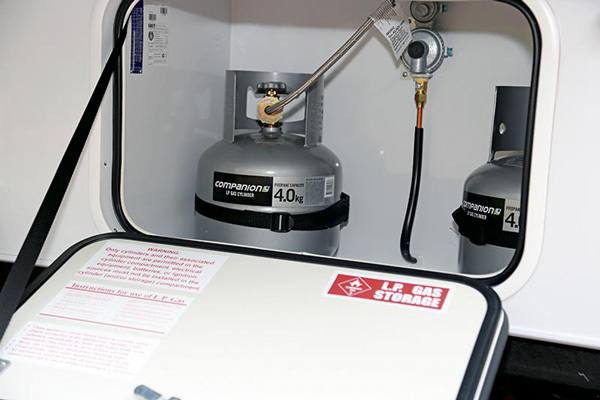 Cooking facilities include a four-burner cooktop and grill with working space on both sides of the bench. There are also plenty of cupboards, overhead lockers and drawers. Across the way, the dinette will seat four people comfortably. Due to its location in the slide-out, there are no overhead lockers but there is a large window which is ideal for watching as the world goes by. Two powerpoints (one inverter-supplied) are mounted at the base of the forward facing seat and, while being a convenient location for the builder, it’s not ideal for the user as the plugs and leads are vulnerable to being kicked out. 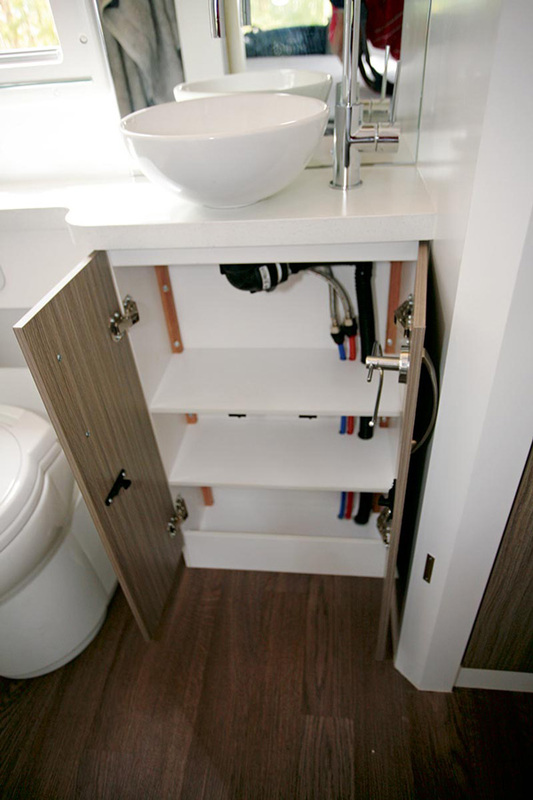 The rear bathroom isn’t quite full-width because there’s a full-height wardrobe in the nearside rear corner. 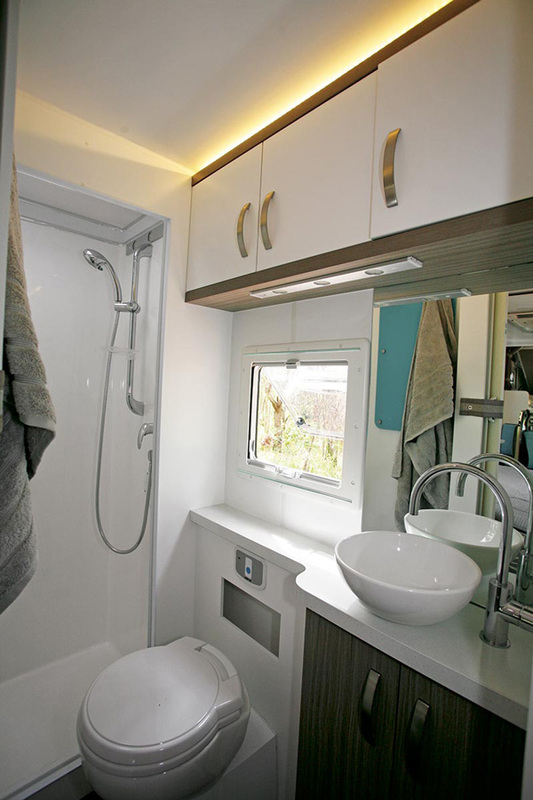 It’s a great little addition, and there’s still plenty of room in the bathroom for the shower cubicle, cassette toilet and vanity cabinet complete with a wash basin and very stylish tapware. 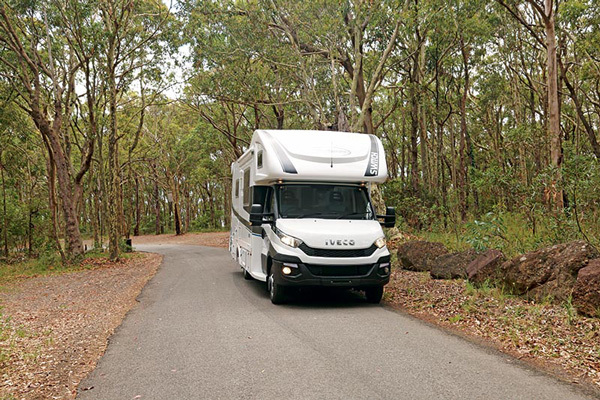 That bathroom tap probably sums up the rest of the motorhome – stylish in just about every aspect, from the eight-speed Iveco gearbox to the little wall compartments in the kitchen and bathroom. 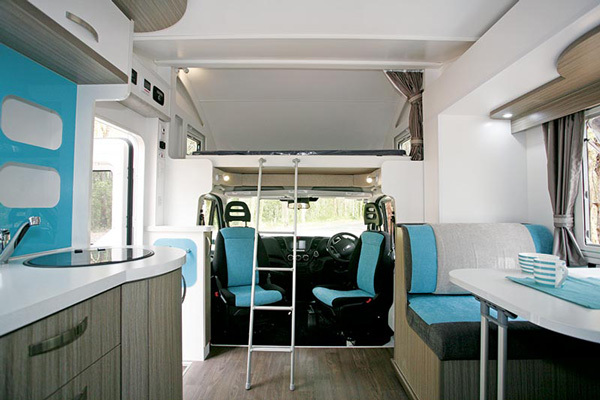 The slide-out adds a considerable amount of interior space but it’s useful that the motorhome living area can be used almost as easily with the slide-out closed up. 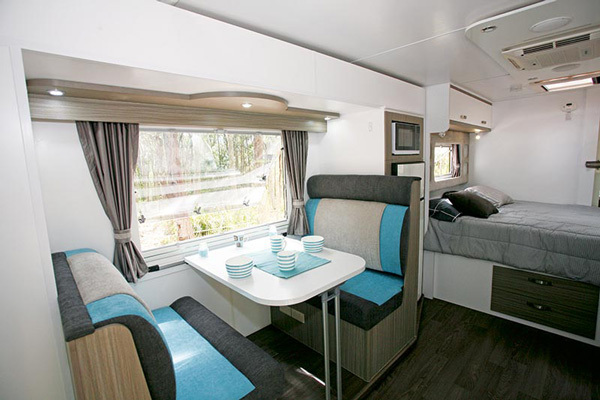 The Sunliner Switch S541 certainly has more than a few luxury fittings and could cope quite easily with long distance, luxury touring.